4. the dense core of an atom, made of protons and neutrons held together by the strong nuclear force. Traveling in orbit around it is a cloud of negatively charged particles called electrons. The number of protons in the atomic nucleus gives a substance its identity as a particular element. Called also atomic nucleus. adj., adj nu´clear. 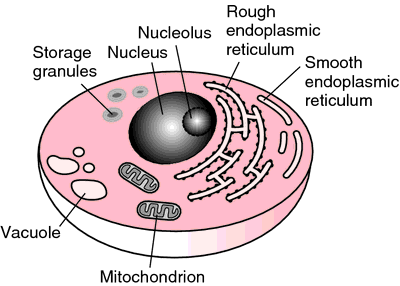 The nucleus and nucleolus of a cell. From Mahon and Manuselis, 2000.
nucleus ambi´guus the nucleus of origin of motor fibers of the glossopharyngeal, vagus, and accessory nerves in the medulla oblongata. nucleus an´sae lenticula´ris (nucleus of ansa lenticularis) a collection of neurons in the ansa lenticularis as it curves around the medial edge of the globus pallidus. arcuate nuclei of medulla oblongata, nu´clei arcua´ti medul´lae oblonga´tae small irregular areas of gray substance on the ventromedial aspect of the pyramid of the medulla oblongata. atomic nucleus nucleus (def. 3). basal nuclei (nu´clei basa´les) specific interconnected subcortical masses of gray matter embedded in each cerebral hemisphere and in the upper brainstem, comprising the corpus striatum (caudate and lentiform nuclei), amygdaloid body, claustrum, and external, extreme, and internal capsules. Called also basal ganglia. caudal olivary nucleus a folded band of gray substance enclosing a white core, which produces the elevation on the medulla oblongata known as the olive. caudate nucleus (nucleus cauda´tus) an elongated, arched gray mass closely related to the lateral ventricle throughout its entire extent, which, together with the putamen, forms the neostriatum. nucleus ceru´leus a compact aggregation of pigmented neurons lying below the locus ceruleus. cochlear nuclei, anterior and posterior the nuclei of termination of sensory fibers of the cochlear nerve (see anatomic Table of Nerves in the Appendices); they partly encircle the inferior cerebellar peduncle at the junction of the medulla oblongata and pons. dentate nucleus (nucleus denta´tus) the largest of the deep cerebellar nuclei, lying in the white matter of the cerebellum just lateral to the emboliform nucleus. droplet nuclei small particles of pathogen-containing respiratory secretions expelled into the air by coughing, which are reduced by evaporation to small, dry particles that can remain airborne for long periods; one possible mechanism for transmission of infection from one individual to another. emboliform nucleus (nucleus embolifor´mis) a small cerebellar nucleus lying between the dentate nucleus and the globose nucleus and contributing to the superior cerebellar peduncles. fastigial nucleus (nucleus fasti´gii) the most medial of the deep cerebellar nuclei, near the midline in the roof of the fourth ventricle. globose nucleus (nucleus globo´sus) a cerebellar nucleus lying between the emboliform nucleus and the nucleus fastigii and projecting its fibers via the superior cerebellar peduncle. intracerebellar nuclei four accumulations of gray matter embedded in the white matter of the cerebellum, comprising the dentate nucleus, emboliform nucleus, nucleus fastigii, and globose nucleus. lenticular nucleus (lentiform nucleus) the part of the corpus striatum somewhat resembling a biconvex lens, divided into a larger external or lateral part called the putamen and a smaller light colored internal or medial part called the globus pallidus. motor nucleus any collection of cells in the central nervous system giving origin to a motor nerve. olivary nucleus a folded band of gray matter that encloses a white core and produces the elevation called the olive on the medulla oblongata; it receives heavy projections from the spinal cord, mesencephalon, and cerebral cortex and projects fibers via the contralateral inferior cerebellar peduncle. nuclei of origin, nu´clei ori´ginis groups of nerve cells in the central nervous system from which arise the motor, or efferent, fibers of the cranial nerves. paraventricular nucleus (nucleus paraventricula´ris) a band of cells in the wall of the third ventricle in the supraoptic part of the hypothalamus; many of its cells are neurosecretory in function and project to the neurohypophysis, where they secrete oxytocin (and, to a lesser extent, antidiuretic hormone). pontine nuclei, nu´clei pon´tis masses of nerve cells scattered throughout the ventral part of the pons, in which the longitudinal fibers of the pons terminate, and whose axons in turn cross to the opposite side and form the middle cerebellar peduncle, which projects fibers to the neocerebellum. nucleus pro´prius a column of large neurons that extends throughout the posterior horn of the spinal cord. nucleus pulpo´sus (pulpy nucleus) a semifluid mass of fine white elastic fibers forming the center of an intervertebral disk. red nucleus (nucleus ru´ber) an oval mass of gray matter (pink in fresh specimens) in the anterior part of the tegmentum and extending into the posterior part of the hypothalamus; it receives fibers from the cerebellum. sensory nucleus the nucleus of termination of the afferent (sensory) fibers of a peripheral nerve. supraoptic nucleus (nucleus supraop´ticus) one just above the lateral part of the optic chiasm; many of its cells are neurosecretory in function and project to the neurohypophysis, where they secrete antidiuretic hormone (ADH) and, to a lesser extent, oxytocin; other cells are osmoreceptors that stimulate ADH release in response to increased osmotic pressure. tegmental nucleus, laterodorsal several nuclear masses of the reticular formations of the pons and midbrain, especially of the latter, where they are in close approximation to the superior cerebellar peduncles. thoracic nucleus (nucleus thora´cicus) thoracic column. vestibular nuclei, nu´clei vestibula´res the four cellular masses in the floor of the fourth ventricle: superior (rostral or cranial), lateral, medial, and inferior (caudal) vestibular nuclei; in them are the terminations of the branches of the vestibular nerve (see anatomic Table of Nerves in the Appendices). The nuclei give rise to a widely dispersed special sensory system through projections to motor nuclei in the brain stem and cervical cord, to the cerebellum, and to motor cells throughout the spinal cord; they also have connections that provide for conscious perception of, and autonomic reactions to, labyrinthine stimulation. Centralized portion of the atom; composed of protons and neutrons. In chemistry, the heavy, positively charged, central part of an atom, which contains protons, neutrons, and most of the atomic mass. Iranian Deputy Foreign Minister Hassan Qashqavi said three days after the reported attack, "There has been no Iranian nuclear scientist in Syria. A man alleged to be an agent for the Israeli intelligence agency Mossad is claimed to have been hanged in Iran after being convicted of killing a nuclear scientist. Tehran has in the past accused Israel of being behind the killings of its nuclear scientists. Fars says he was killed by Mossad agents, who used a method of attack similar to that used against Iranian nuclear scientist Massoud Ali Mohammadi in January 2010, as well as scientists Fereidoun Abbassi Davani and Majid Shahriari. Mr Roshan was the fourth nuclear scientist killed in Iran in the past two years. BEIRUT: Hezbollah condemned Wednesday the killing of an Iranian nuclear scientist by "Zionist terrorism," expressing confidence that the attack would not stall Iran's progress in the atomic field. However, several Iranian nuclear scientists have been assassinated in recent years. An Iranian nuclear scientist was assassinated on the street in Tehran, not the first. Local reports from Iran have stated that a nuclear scientist linked to the nation's controversial atomic programme has been shot dead by unknown assailants outside his house. TEHRANL: An Iranian physicist was shot dead by a motorcyclist in Tehran on Saturday and Iran's student news agency ISNA quoted an unnamed police official as saying the man was a nuclear scientist. Every nuclear scientist who has a 'car accident'," she wrote, should be thought of "as the ultimate targeted sanction. Summary: An Iranian nuclear scientist was killed on Monday and another university professor and his wife were hurt.